Gary Guggenberger was born in 1947 in Cold Spring, Minnesota. He enlisted in the U.S. Army on February 6, 1968, and after completing basic training at Fort Campbell, Kentucky, and advanced individual training at Fort Polk, Louisiana, he deployed to Southeast Asia as a vehicle driver with the 352nd Transportation Company of the 6th Transportation Battalion at Long Binh, South Vietnam, in July 1968. 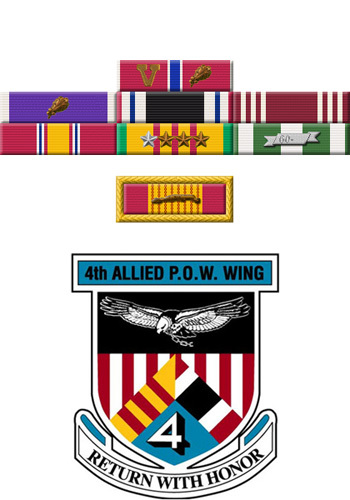 A vehicle convoy Sgt Guggenberger was in was ambushed, and he was captured and taken as a Prisoner of War on January 14, 1969. After spending 1,491 days in captivity, he was released during Operation Homecoming on February 12, 1973. He was briefly hospitalized to recover from his injuries at Fitzsimons Army Medical Center in Aurora, Colorado, and was medically retired from the Army on August 6, 1973. After his retirement from the Army, Gary attended Colorado Mountain Community College, and then worked for the Colorado Division of Wildlife as a Wildlife Technician, Hatchery Supervisor, and Research Technician from 1977 until his retirement in August 2002. 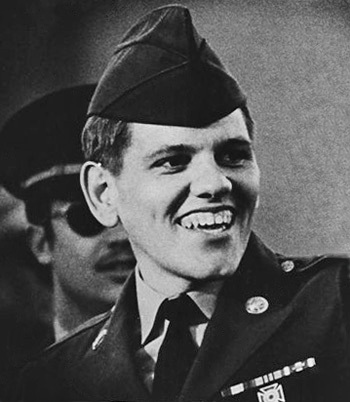 Staff Sergeant Gary J. Guggenberger distinguished himself by heroic actions against an enemy force of the United States of America while serving as a Prisoner of War in Cambodia from 30 May 1972 to 20 June 1972. Staff Sergeant Guggenberger conducted himself in a highly commendable manner during a confrontation between the senior ranking officer of the prison camp, Lieutenant Colonel Schrump, and the prison camp officials and cadre. The senior ranking American officer had been ordered to make bamboo states for perimeter security of the prison camp since they would serve as a deterrent to prisoners in any attempt to escape. Refusing to obey this order, the colonel was threatened and punished for many days, and although suffering from malaria, was refused medical aid. Realizing that their punishment would not change the colonel's mind, the prison camp officials then refused to give him food or water. At hearing this, although weak and suffering from severe malnutrition, Staff Sergeant Guggenberger endangered his well-being by giving the colonel his full support by refusing to eat or drink until the camp cadre gave Colonel Schrump food and water. This condition continued for several days until a final decision was made and Colonel Schrump was returned to his cell, given food and water, and normal camp life was restored. During this period, Staff Sergeant Guggenberger's courage, aggressiveness, and leadership by example were in the highest traditions of the military service and reflected great credit upon him and the United States of America.